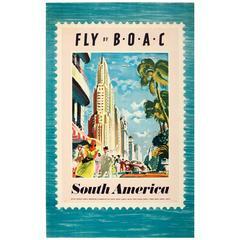 Original vintage travel advertising poster – BOAC Monarch Stratocruiser London to New York London to Montreal. Great image featuring a smartly dressed airline steward and stewardess leading passengers wearing fashionable clothes, hats and stylish sunglasses and carrying their coats, bags and hat boxes from a BOAC plane with the speedbird logo and the British Union Jack flag on its tail fin marked G-BOAC, the title above in bold letters with the stylized Monarch crown logo and British Overseas Airways Corporation in italics below. The Boeing 377 Stratocruiser (1949-1963) was a long distance double decker plane that featured a pressurized cabin. (The British Overseas Airways Corporation / BOAC was the British state airline created in 1940-1946 as the result of a merger, merging again in 1971-1974 to create British Airways / BA.) Printed in Great Britain. Good condition, staining, foxing, misregistered print, backed on linen. Good condition, staining, foxing, misregistered print, backed on linen. Original US movie poster for the 1985 cult Classic directed by Robert Zemeckis and staring Michael J. Fox, Christopher Lloyd. Artist: Anonymous Year 1900s Dimensions: 90 x 55 cm Condition: Excellent Format: Linen backed. Artist: Anonymous Year: 1973 Dimensions: 92 x 64cm Condition: Excellent condition Format: Linen backed. Artist: Anonymous Year 1935 Dimensions: 70 x 53 cm Condition: Excellent Format: Linen backed. Artist: Dorfi Year: 1925 Dimensions: 133 x 94 cm Condition: Excellent Format: Linen backed.